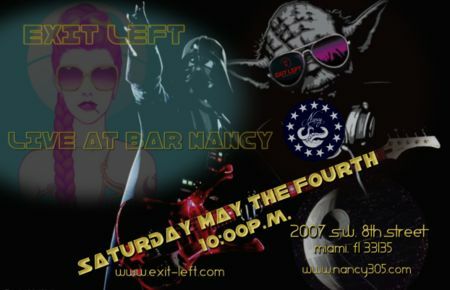 We’re very excited to be making our debut at Bar Nancy on national Star Wars Day!! Join Exit Left as we take you on an intergalactic journey through the musical ages at one of the hottest spots in the 305. We’ll be rockin’ out all your favorite 70s through 2000s classic, alternative and modern rock hits. Bar Nancy is conveniently located on Calle Ocho in the heart of little Havana close to Downtown, Brickell, Coral Gables and Coconut Grove. Drink dine and dance to your heart’s content! There is no cover for this event and Bar Nancy boasts amazing American craft cocktails AND happy hour 7 days a week from 4p – 7p. May the Fourth be with YOU!